This recipe makes the creamiest, fluffiest and velvety hummus ever. In my humble opinion, this tops any grocery store hummus. But because I cheat, you can make this, easily and inexpensively, anytime. (Patti Diamond) A few ingredients is all it takes to make hummus at home. 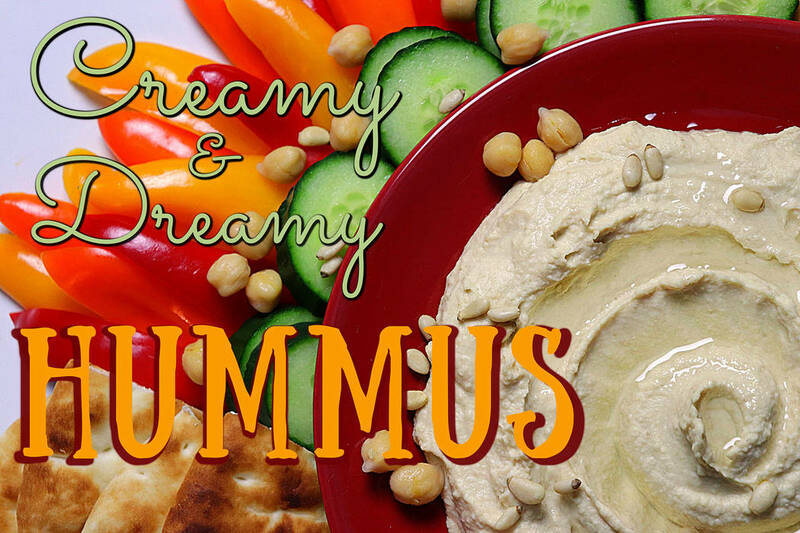 Hummus is an eons-old Middle Eastern classic. Traditionally, hummus is made from chickpeas (aka garbanzo beans), tahini, olive oil, lemon juice, garlic and salt. That’s it and that’s all. Tahini is a paste of ground sesame seeds and can be a little expensive. You can substitute other nut butters but it’s not the same. I paid $5 for 16 ounces of tahini, which will make eight batches of hummus at 62 cents per batch. Once you have tahini, the major expense to make hummus is a can of garbanzos. Usually, to make creamy hummus you’d soak dried garbanzos overnight then boil them until they’re falling apart. I don’t have that kind of forethought; I want hummus now. You could also use canned beans, but the hummus texture comes out grainy. Here’s the cheat: Simmer canned beans to make them super tender so they whip up perfectly smooth. Then let’s make garlic-infused olive oil for roast garlic flavor without having to roast the garlic. This is one time to break out the good olive oil. Optional garnish: Pinch of paprika or cumin, pine nuts, parsley. Serve with pita bread, sweet peppers, cucumber and olives. Drain and rinse garbanzos and place in a saucepan. Cover with water by 1 inch and heat to boiling. Reduce heat and simmer beans for 20 minutes. Meanwhile, mince the garlic and place in a small pan with olive oil. Let this warm gently until the garlic starts to bubble. Turn off heat and let rest while the beans simmer. Drain and cool the beans. The order in which you process the ingredients is important. In the bowl of a food processor, cream together the tahini and lemon juice for 1 minute, then scrape the sides of the bowl and process another minute. Add the olive oil with garlic, cumin and salt to the tahini and lemon. Process for 1 to 2 minutes, scraping the sides and bottom of the bowl occasionally until well blended. Add half of the chickpeas and process for 2 minutes. Scrape sides and bottom of the bowl, then add the remaining chickpeas and continue to process another 2 minutes until very smooth. To make this completely smooth; slowly add 2 to 3 tablespoons of ice water until you reach the perfect consistency. Adjust seasonings as desired. Serve drizzled with olive oil and dash of paprika. As I wrote this column, I made the recipe three times. It kept disappearing before I could get a photograph. Enjoy! Lifestyle expert Patti Diamond is the recipe developer and food writer of the website “Divas On A Dime – Where Frugal, Meets Fabulous!” Visit Patti at www.divasonadime.com and join the conversation onFacebook at DivasOnADimeDotCom. Email Patti at divapatti@divasonadime.com.